The findings of the study, to be presented at the European Congress on Obesity in Vienna tomorrow (Friday, 25 May), reiterate the importance of milk in the child's diet despite its declining consumption. "Our findings indicate that obese children who consume at least the daily recommended amount of milk may have more favorable sugar handling and this could help guard against metabolic syndrome," said Michael Yafi, M.D., the study's first author and professor of pediatrics at McGovern Medical School at UTHealth. "Worryingly, only one in 10 young people in our study were consuming the recommended amount of milk." Milk consumption in America has consistently fallen over the past few decades, according to the United States Department of Agriculture, especially among adolescents where it has dropped by nearly half – to less than a cup daily – between 1977 and 2006. "Parents have started to look at milk not as a good thing and they are wary of it. 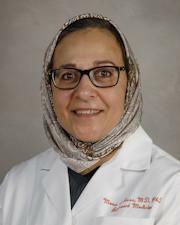 The message to them is not to be scared of milk, or to limit its consumption, and to encourage children of all ages to keep drinking it freely," said Mona Eissa, M.D., M.P.H., Ph.D., the study's principal investigator and professor of pediatrics and adolescent medicine at McGovern Medical School at UTHealth. Metabolic syndrome is defined as the presence of at least three of five conditions that increase the risk of diabetes, heart disease, and stroke – high levels of blood sugar or triglycerides, high blood pressure, excess belly fat, and low "good" cholesterol levels. A third of American children and teens are overweight or obese, which is closely linked to the development of metabolic syndrome. Previous studies have shown that milk protects against metabolic syndrome and diabetes in adults, but this is the first to explore these factors among obese children. "The findings that milk has a healthy effect on high insulin level, which may lead to type 2 diabetes, are significant, particularly given the growing prevalence of this condition among children nowadays," said Eissa, corresponding author. The investigators assessed daily milk intake and its association with fasting levels of insulin – the hormone that stabilizes blood sugar and a biomarker for metabolic syndrome risk – in obese children and adolescents attending a pediatric weight management clinic. They carried out a retrospective chart review of 353 obese children and adolescents over a two-year period (between December 2008 and December 2010). Information on fasting serum insulin was available for nearly half of the participants at their first visit. The research team also recorded information on daily milk intake, milk types, daily fruit juice and other sugary drinks intake, fasting blood glucose and insulin sensitivity. More than half of the participants, all between the ages of 3 and 18, were male; three quarters were Hispanics; and the average age was 11.3 years. On average only 23 of 171 children reported drinking the daily recommended intake of two to three cups. Girls reported drinking less milk than boys, but no difference in intake was noted by ethnicity. The American Academy of Pediatrics and the 2015 Dietary Guidelines for Americans advise two to three cups of low fat milk (1 percent or 2 percent) a day for children over the age of 2. The study also found that under half (44 percent) of children who reported drinking less than one cup a day had below the upper normal levels of fasting insulin, compared to almost three-quarters (72 percent) of children who reported drinking more than two cups a day. Overall, children who drank less than one cup of milk each day had significantly higher levels of fasting insulin than those who drank at least two cups a day. After adjusting for other aspects that might affect insulin levels, including race, ethnicity, gender, level of physical activity, sugary drinks intake, glucose levels and type of milk based on fat content, the researchers found lower fasting insulin levels among children who drank at least two cups of milk a day. No association was noted between milk intake and blood glucose or lipid levels. "The link between sugary drinks and childhood obesity is well-documented. Vitamin D deficiency has also been connected to this. By contrast, from a preventive perspective, our pilot study suggests that milk intake is not only safe but also may protect against development of metabolic syndrome," Eissa said. "Yet fewer children are drinking enough, especially with growing concerns over fat content and dairy intolerance. Only a small percentage of children are actually intolerant to milk so parents shouldn't be afraid of milk or cut back on it." Eissa said since the sample size was relatively small and includes mostly Hispanic children, future studies should be done to confirm findings. "Nonetheless this still presents reasonable grounds to stick with the recommended daily amount and to make friends again with milk," Eissa added.